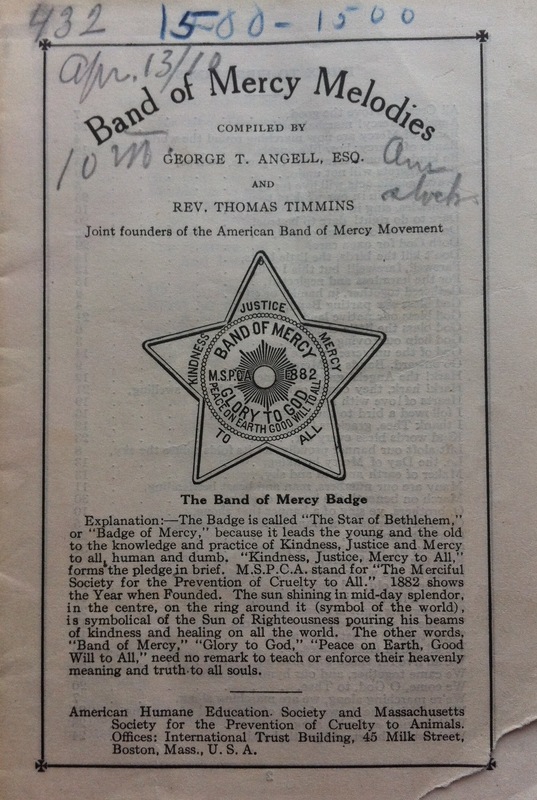 This songbook was originally compiled by George T. Angell and Reverend Thomas Timmins, the two men who brought the Band of Mercy movement to the United States in 1882. The copy of the songbook in this exhibit dates to 1910, a testament to the popularity of this publication. Band of Mercy Melodies was published by the American Humane Education Society (AHES) and the Massachusetts Society for the Prevention of Cruelty to Animals (MSPCA). Page from Band of Mercy Melodies, 1910. Collection of MSPCA Angell. Within the pages of Band of Mercy Melodies are the lyrics to several songs that were meant to be sung by children at Band of Mercy meetings. The musical scores are not provided in this publication, however, there are frequently suggestions as to which tune the song should be sung to. 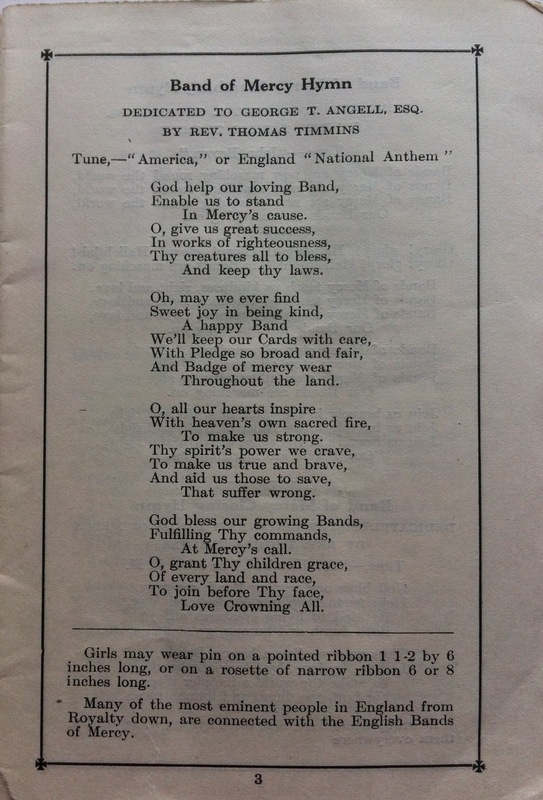 In the example above, the “Band of Mercy Hymn” was meant to be sung to the tune “America” or to the tune of the English National Anthem. Sing Band of Mercy Hymn and repeat the Pledge together. Remarks by President and reading of report of last meeting by Secretary. Readings, Recitations, “Memory Gems,” and Anecdotes of good and noble sayings, and deeds done to both human and dumb creatures, with vocal and instrumental music. Sing Band of Mercy Marching Hymn. A brief address. Members may then tell what they have done to make human and dumb creatures happier and better. Sing Band of Mercy Closing Hymn.